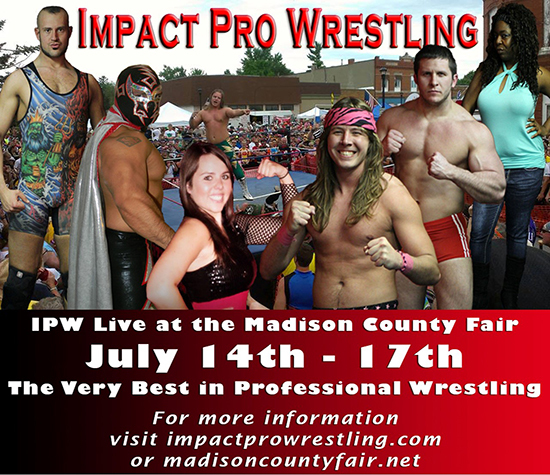 “Dive to new depths at the Madison County Fair July 13-17! Bring the entire family because there is something for everyone, and the best part is free gate admission. 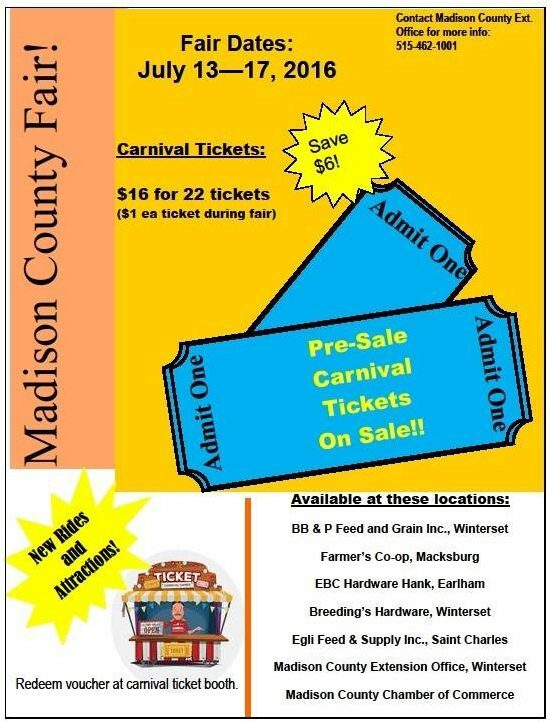 To prepare for the fair and save money, buy some pre-sale carnival tickets at several different locations around Winterset, Earlham, Macksburg, and St. Charles by Friday, July 8th. When fair time comes, Next Generation Carnival opens every day at 5:00 pm. During the day there are plenty of free events to keep the entire family entertained, such as livestock shows, impact pro wrestling, the little farmer barn, face painting, Mr. Nick’s balloon animal creations, and meeting the little animals. On Wednesday, July 13, the real show is at 6:30 when the new King and Queen will be crowned! 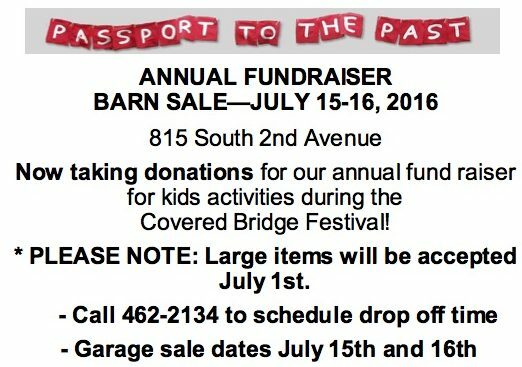 Thursday July 14 is Day Care Day at the fair, and on Friday July 15 there is a horseshoe pitching contest and a celebrity swine show. Saturday, July 16 is kids’ day at the carnival, where children can buy an arm band and ride all the rides they want from 1:00 pm to 5:00 pm. Not only that, but there is an exciting Archery tournament and the bottle calf show. Sunday July 17, there is Cowboy Church at 9:30 am, a cookout contest, and the Farm Chore Olympics. After all the animals have gone to sleep the real fun begins with the grandstand events. Wednesday night is Beck’s Hybrids Truck Pull starting at 7:00pm. If you want to see the roughest and toughest cowboys, then Thursday and Friday are your nights because the Hy-Vee Rough Stock Rodeo begins at 8:00 pm both nights. Saturday’s grandstand event is the R&B Tire and Auto Circle Track Mud Run and Sunday is the R&B Mud Bog. Both events start at 7:00 pm, so get there early to get your seats. 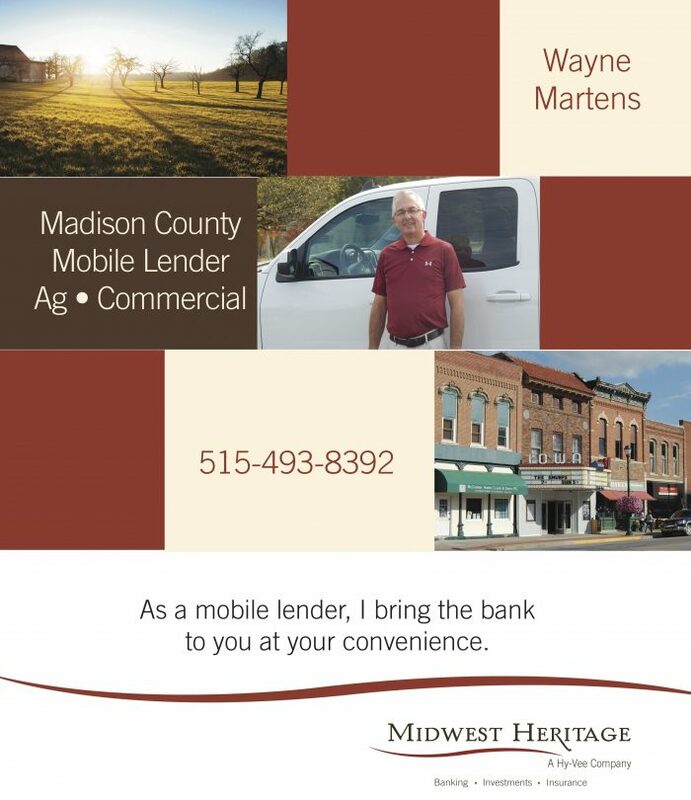 On the Friday afternoon of the fair at 2:00 pm, look for Winterset’s Wayne Martens of Midwest Heritage Bank behind the bleachers (east side) of the cattle show ring. He’ll be handing out free watermelon until 4:00, or until he runs out, whichever comes first! 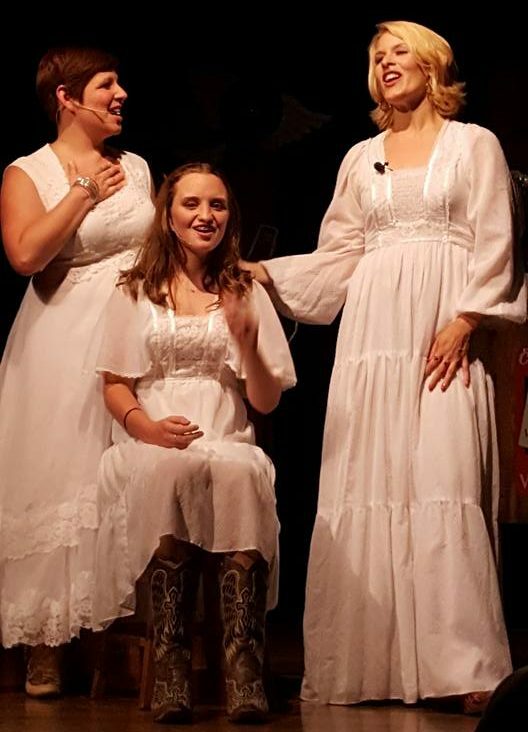 This is the final performance weekend for “Honky Tonk Angels” at The Winterset Stage, with remaining shows on Friday and Saturday evenings at 7:30 pm. Call The Winterset Stage at 515-462-5156 to inquire, or visit www.thewintersetstage.org/mainstage-season.html to purchase tickets online. Don’t miss your chance to see Honky Tonk Angels in its last weekend at The Winterset Stage! 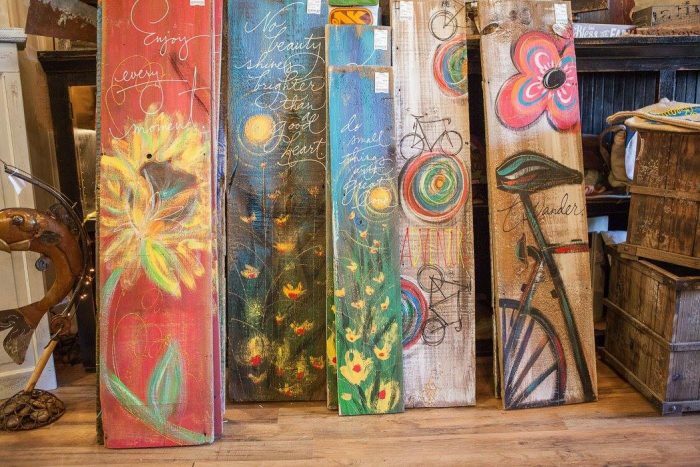 Re:home is also open this weekend through Saturday, as well as next weekend during the fair. Re:home is open today (Friday) from 10:00 to 6:00, and Saturday 9-5. 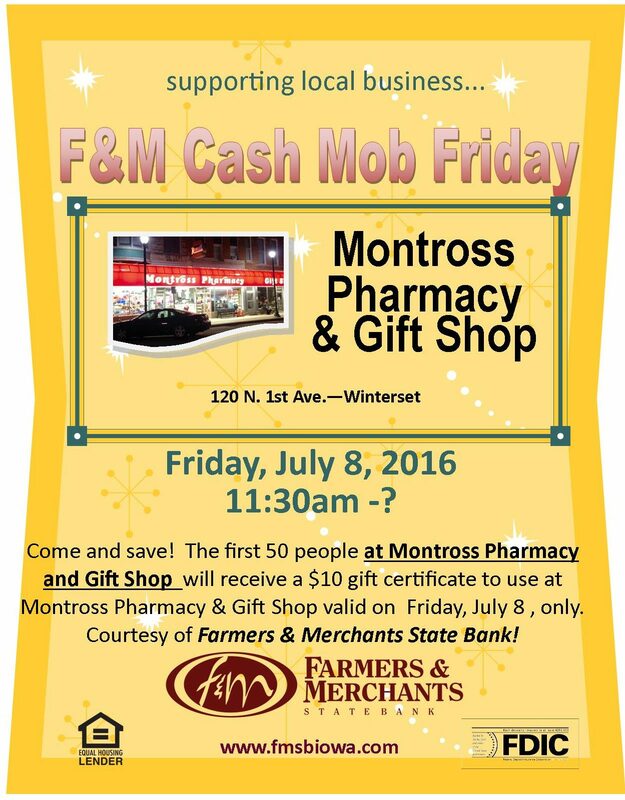 Cash Mob Friday by Farmers & Merchants State Bank is back, and the location is Montross Pharmacy & Gift Shop this Friday (TODAY!) at 11:30 am. Just be in the right place at the right time and you’ll get $10 to spend on anything you like! This Saturday, July 9th, Winterset Ballet & Dance is offering a dance intensive at the studio. An adult class will be available from 9:00-10:00 am. Preschool and kindergartners can come from 11:00-12:00 for ballet and a little intro to jazz. In the afternoon, dancers from Ballet Des Moines are coming to teach master classes! Ashton Plummer will be teaching classical ballet, and Hali Hutchison will be teaching jazz/contemporary. Advanced students will have ballet from 1:00-2:30 and jazz/contemporary from 2:45-4:15. Intermediate students will have jazz/contemporary from 1:30-2:30 and ballet from 2:45-3:45. Snacks are also provided. 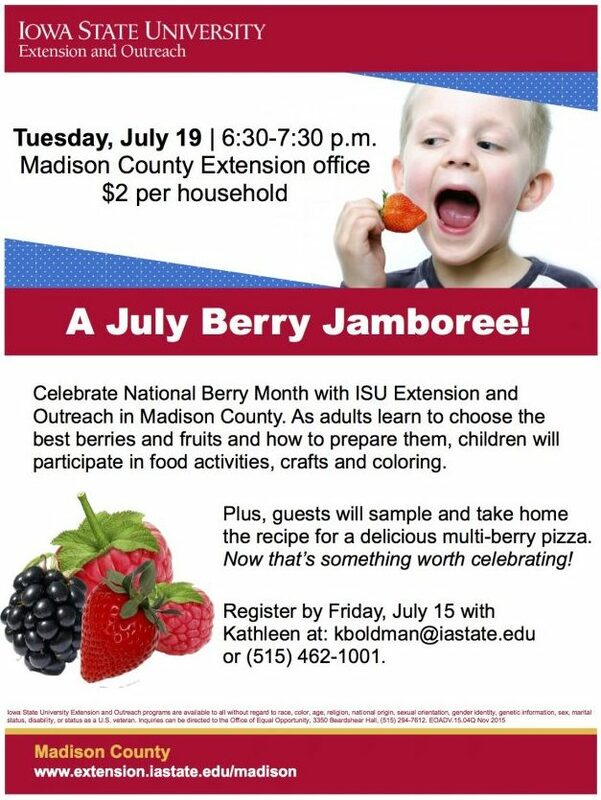 Contact the studio at (515) 201-9403 for more information on this great opportunity. Continuing their very popular Music at the Winery series, Covered Bridges Winery is hosting live music by Park Sixty3 from 7:00 to 10:00 pm at the Winery. Click here if you need directions. 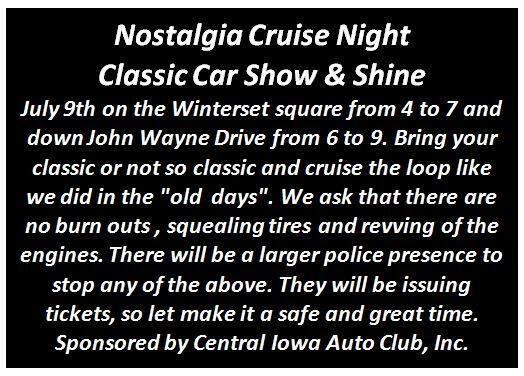 Just bring a blanket or lawn chair and enjoy! On Sunday from 2:00 to 5:00, Two Saints Winery will have live music by the Millstream Band. 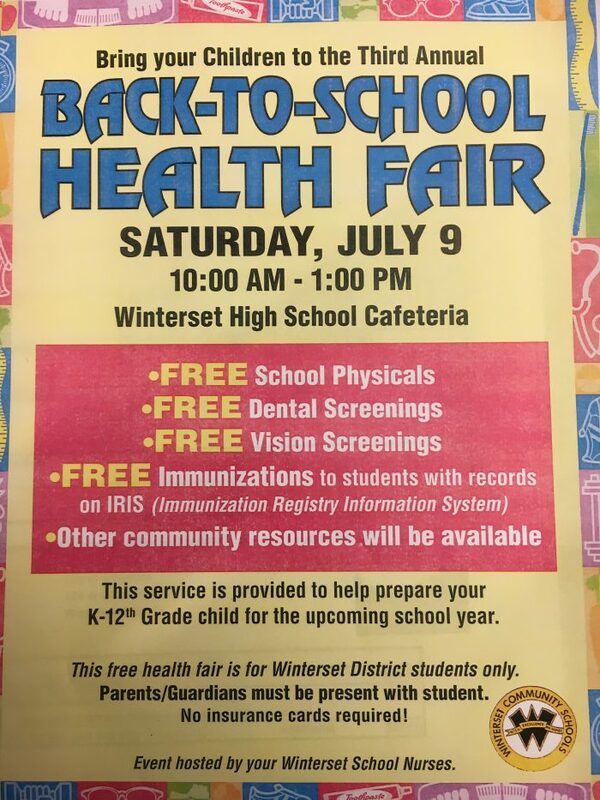 Hosted by the Winterset Library, Jester Puppets will be presented at the VFW Hall (116 N. 3rd St.) on July 13 at 11:00 am. Response to the library’s Blank Park Zoo program was so great that they decided to present the Jester Puppets at the VFW Hall. They look forward to seeing you there to enjoy this high energy summer program, with great thanks to the VFW for allowing them to use the venue for this children’s and family event. Kids, the floor is not carpeted, so bring a blanket or pillow for seating. Registration is not required; it is free and open to the public. 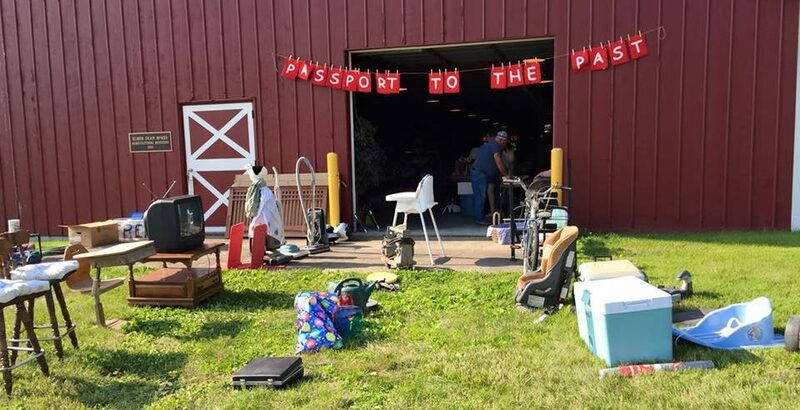 The Madison County Historical Society is now taking donations for its annual Passport to the Past Barn Sale, to be held next weekend during the fair!